16th April 2019. 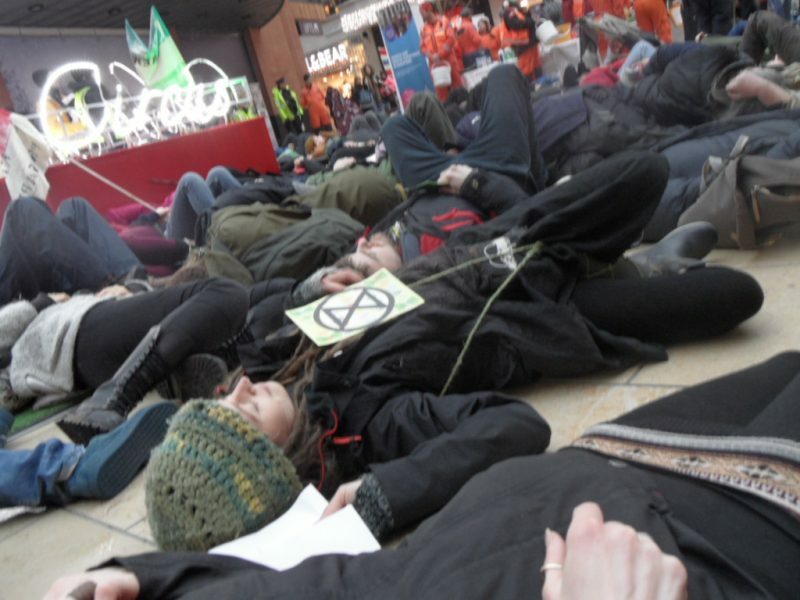 Extinction Rebellion XR have occupied Waterloo Bridge in London for two days so far in their demand for adequate government response (other simultaneous protests in Edinburgh, Nottingham and in 80 other towns in 30 countries . Excellent interest from the public. There have been over 200 arrests so far, including many elderly people who are prepared to remain in London for days to come. Public transport was disrupted and it was regretted that so many members of the public were affected. A group of 15 XR cyclists, mostly old, pause in Taunton, on their way from Falmouth in Cornwall to the big climate demonstration in London from Monday next week. The previous Saturday about 400 Extinction Rebels (XR) had marched through the centre of town, at first in a silent funeral march, followed by a die-in, and later headed by a samba band. 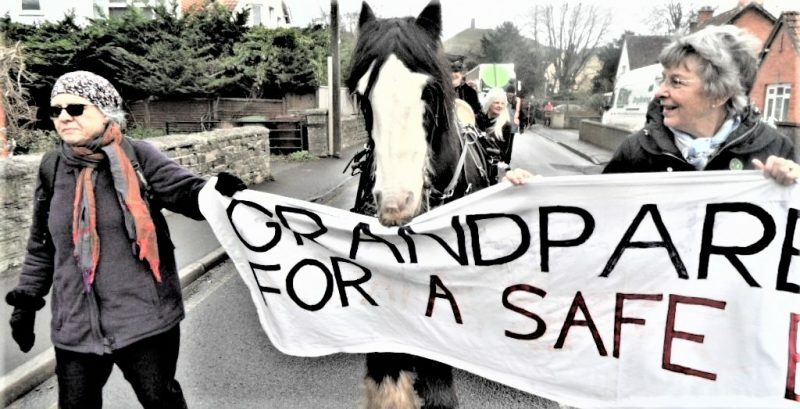 Climate Change at the crossroads: A number of Seniors join an XR (Extinction Rebellion)March for Life group en route (on foot) from Land’s End to London for the International Climate Rebellion Week starting 15th April (video clip at: https://youtu.be/au-nFgN1qDE. Many XR groups across the country are active in the weeks leading up to the Rebellion Week (including Taunton High Street 6th April 11 am). Let us know via the contact page on this website what seniors will be doing/have done in your area. We hope to have another newsletter ready before long. Passim 15th March 2019. 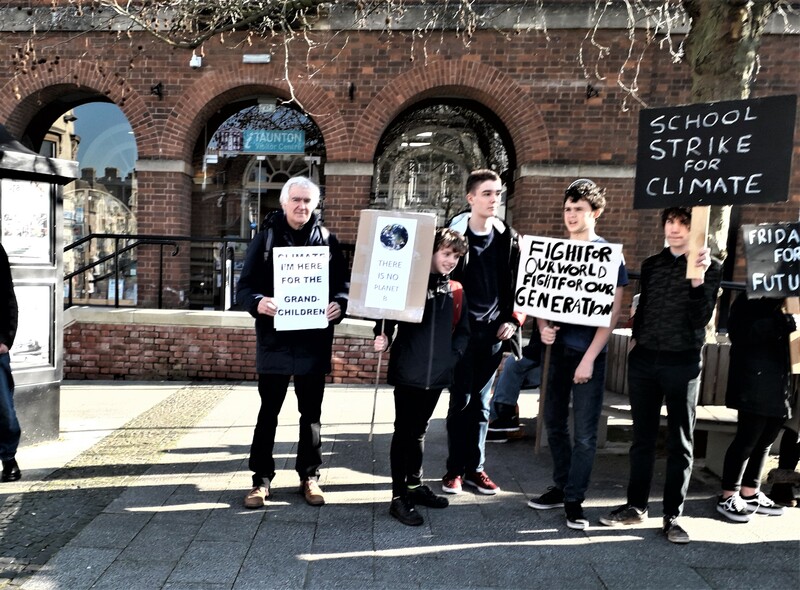 Many School children from across the world protested on this day of action against an adult generation that has served their future well-being badly. 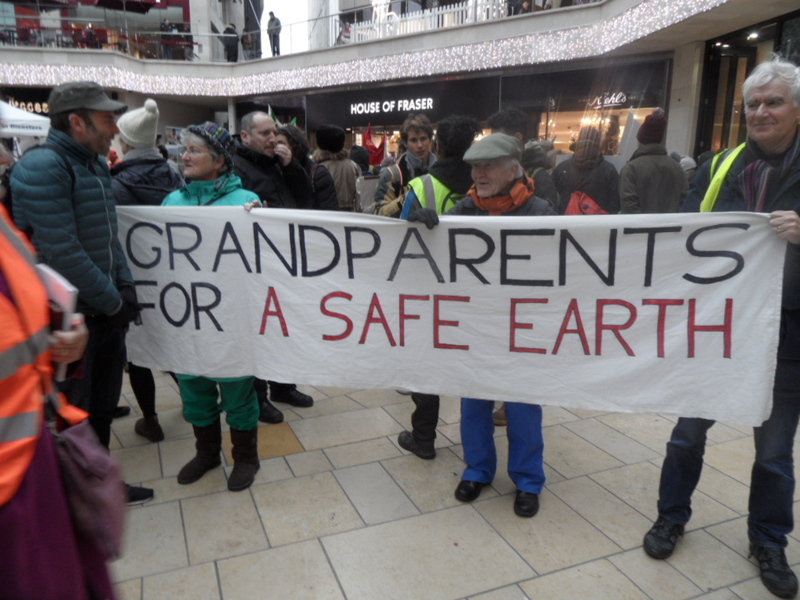 This photo from Taunton in Somerset, where some grandparents and other adults joined in solidarity. London 9th March 2019. 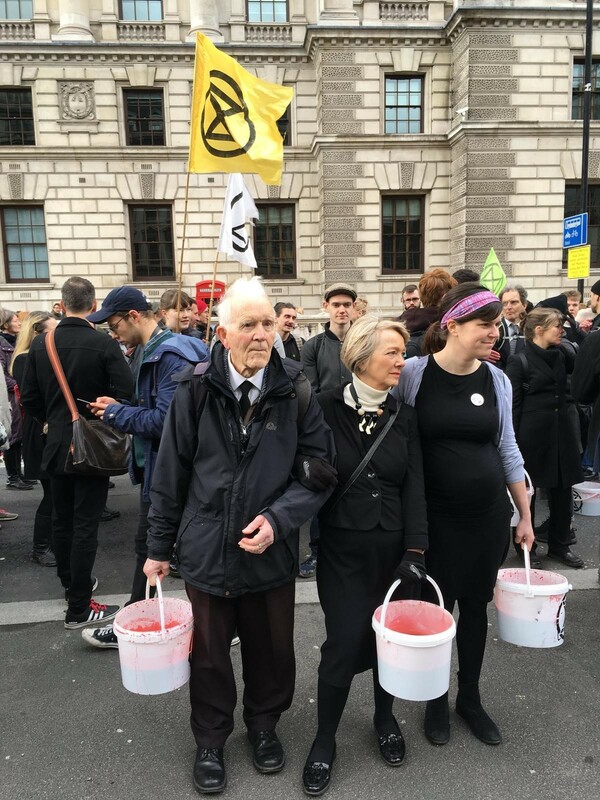 Grandparents Fi Radford and I took part in the ‘Blood of our children on our hands’ Extinction Rebellion Protest in London on 9th March. Hearing the impassioned and knowledgeable statements of the fifteen or so speakers aged between 10 and 20, moved and inspired me. This event had been arranged in liaison with the police. They knew that we would be pouring artificial blood on the road and whilst they agreed to that as being within our right of public protest, they said that if we carried it out we would be arrested for criminal damage. The police closed Whitehall to traffic and people, dressed in black, walked in silence along Whitehall to the entrance to Downing Street. A single ring of a bell marked the slow pace. The young people led the way, followed by about forty-five of us who carried buckets of artificial blood. When we reached Downing Street we stood in an arc facing it, with the young people and many supporters behind. Still in silence, we poured the ‘blood’ down the camber of the road towards Downing Street and sat down behind the empty buckets. 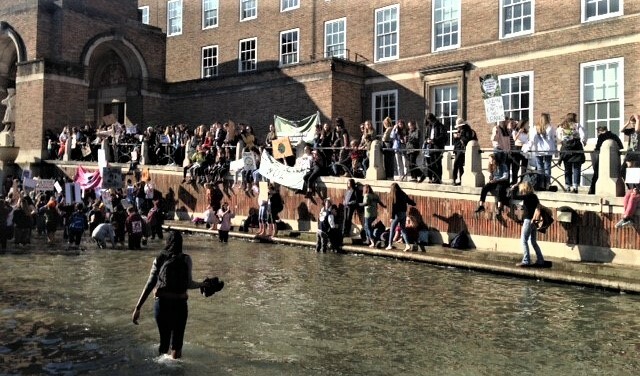 Please send it far and wide to encourage the developing school children’s and student’s strikes; and for all ages to take part in Extinction Rebellion’s international week of action from 15TH to 20th April to draw attention to the environmental and social catastrophe which the world is currently on track for, and which governments – and almost all major opposition parties – are not even speaking the truth about, yet alone taking meaningful action. This rebellion is in the hands of us ordinary people. Only a determined mass movement will force those who currently wield political power to face the truth and act accordingly. 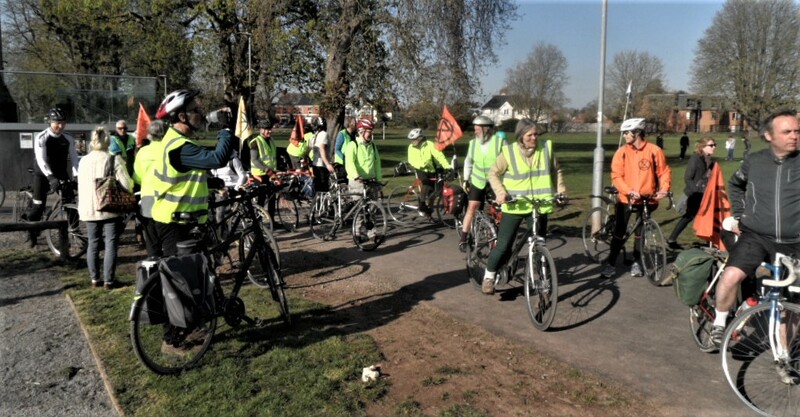 20th and 21st February 2019 Taunton Somerset: Somerset County Council and West Somerset & Taunton Deane Council have now joined the list of councils declaring a climate emergency. But will their pensions committees change their policy on their own fossil fuels investments? Our pensions campaign continues. 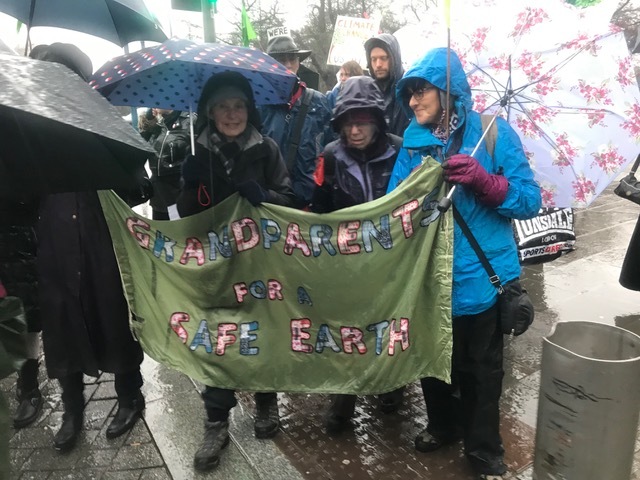 15th February 2019: In Bristol and Taunton a number of grandparents went to support young people who had taken time off from school to protest around climate change. 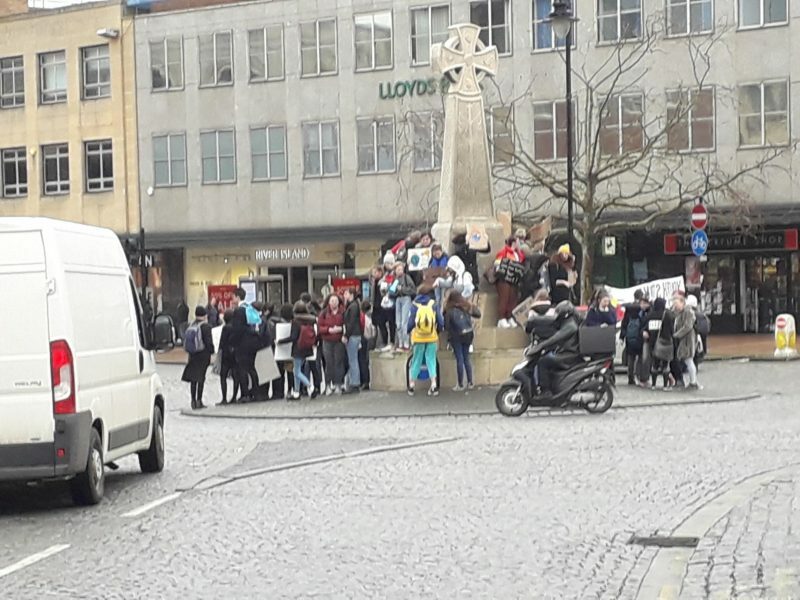 In Bristol approximately 1 000 young people, in Taunton about 50 turned out (for Taunton see YouTube link https://youtu.be/wgQkQms1NDM), some in school uniform to make the point that education is of limited use in a collapsing world. Speeches and marches were energetic, passionate and at times angry, but peaceful. Similar protests took place in about 60 towns around the country, as well as on the Continent. 18th January 2019, Bristol Airport. 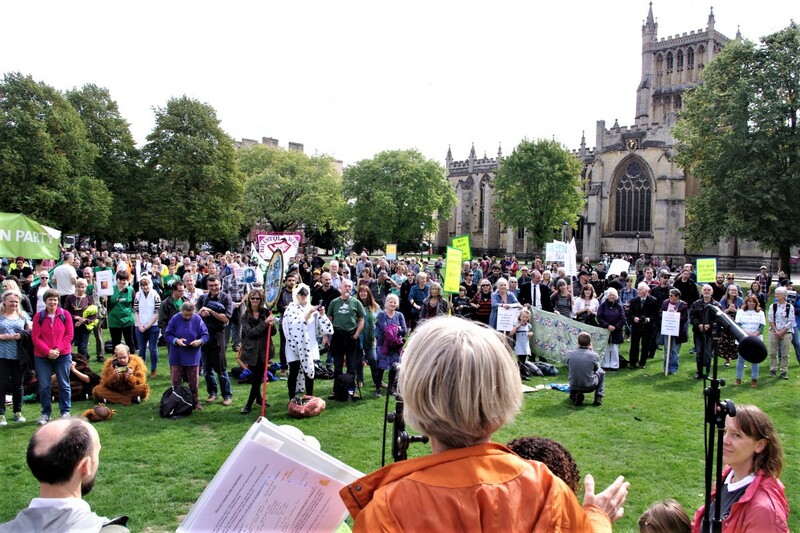 About a hundred protestors affiliated to Extinction Rebellion Bristol demonstrated against plans to extend Bristol Airport. An extension would lead to climate-damaging pollution above from the planes, and from car-congestion below. After a “die-in” to emphasize the point, Member of European Parliament Molly Scott-Cato addressed the protestors. 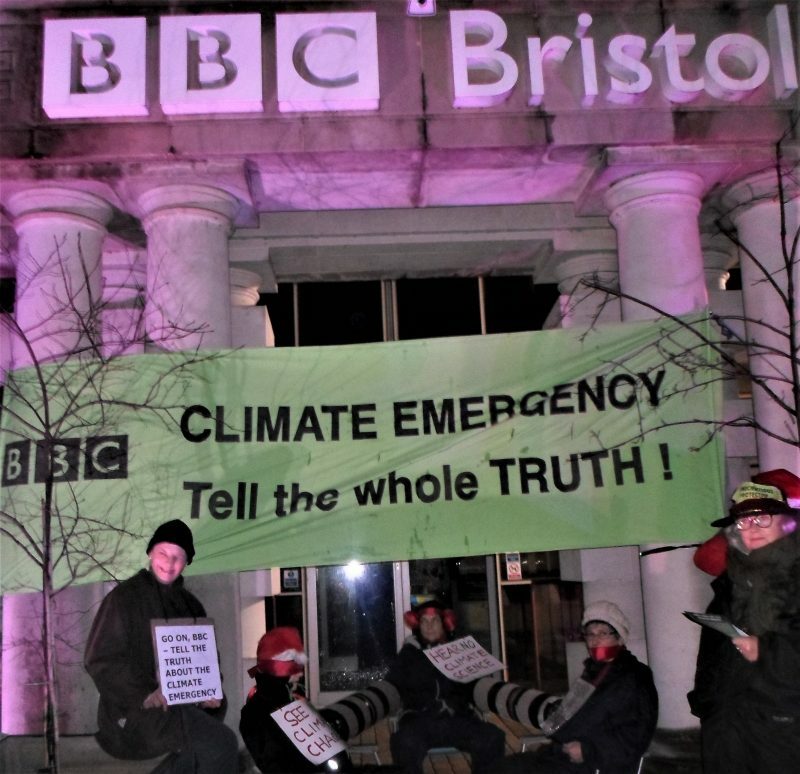 Friday 21st December 2018 There was a protest outside the studio/offices of the BBC in Whiteladies Road, Bristol. 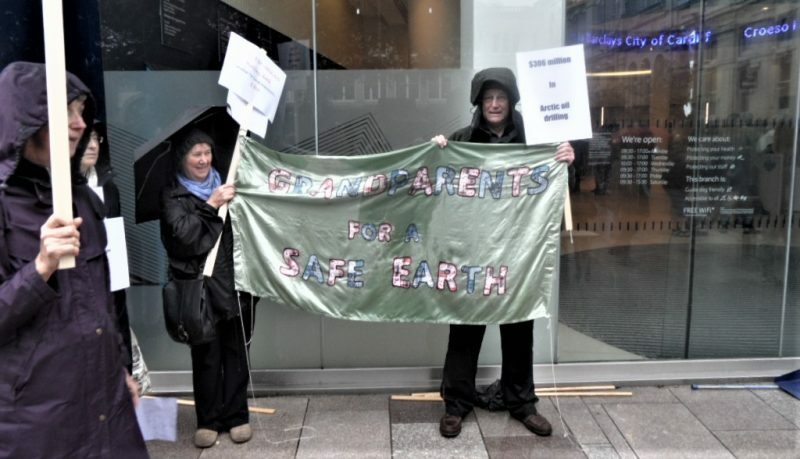 Organiz ed by Extinction Rebellion, it involved a number of grandparents and many others, against the under-reporting by BBC of climate change issues, including the recent Climate Talks in Katowice, Poland. Others phoned their local BBC radio stations, expressing concerns about the failure to broadcast issues about climate change adequately. If you are concerned about this issue, why not phone the national BBC feedback number (0370 010 0222), but prepare your concern first – you will only receive an Answerphone! 15th December 2018 Bristol and Cardiff. 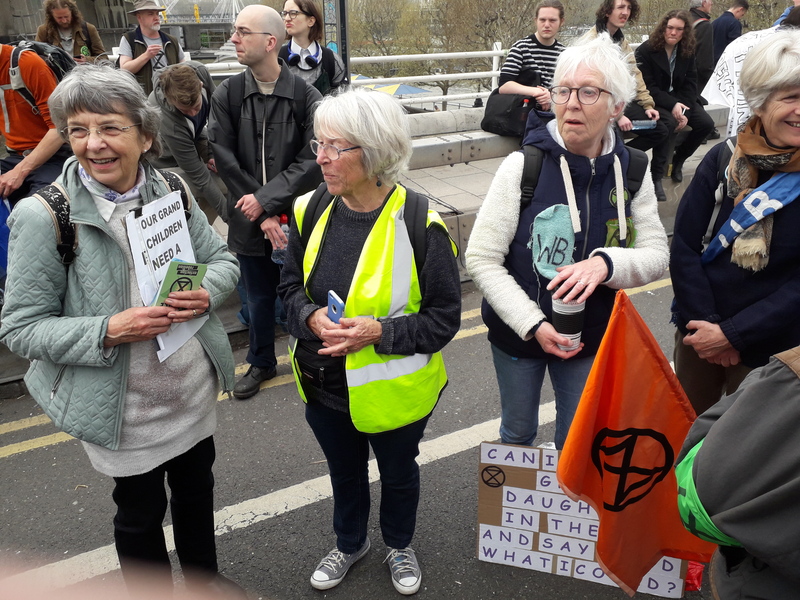 A number of Grandparents joined about 200 others in an Extinction Rebellion event in Central Bristol. This coincided with the final day of the climate change talks in Katowice. 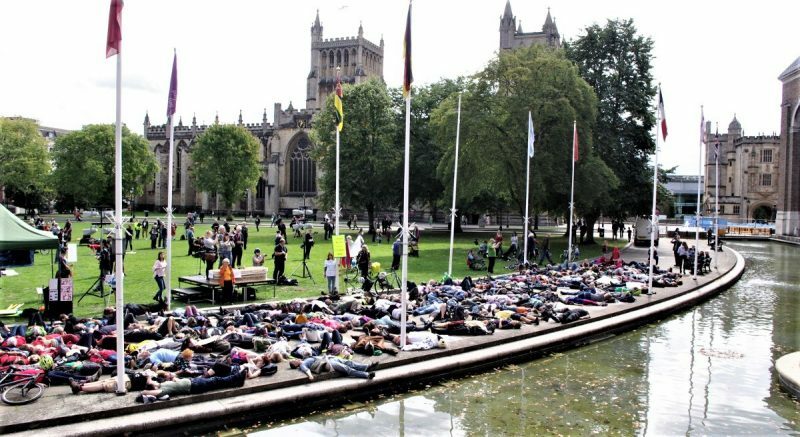 The event included speeches, a climate-change version* (acknowledgement to author unknown) of the carol Twelve Days of Christmas, a die-in to commemorate those who have already died as a result of climate change, a choir, and a march to City Hall/Council House. (* On the 12th day of Christmas my True Love gave to me, 12 years and counting, 11 wells a-fracking, Number 10 ignoring, 9 feet sea rising, 8 million hectares felling, 7 lands a-warring, 6 in 10 are dying, LOTS OF PLASTIC THINGS!, 4 degrees C warmer, 30 years till starving, 2 icecaps a-melting, and a Climate emergency.) 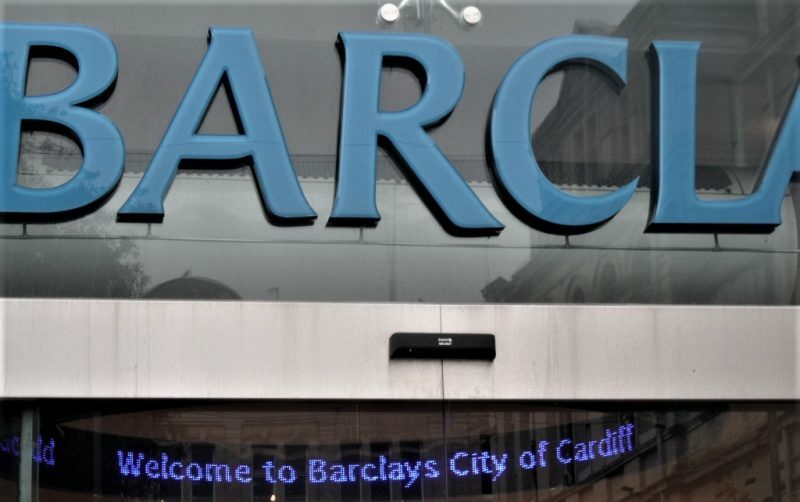 At the same time there was an Extinction Rebellion event in Cardiff, where the weather was considerably wetter and windier! 17th November 2018. 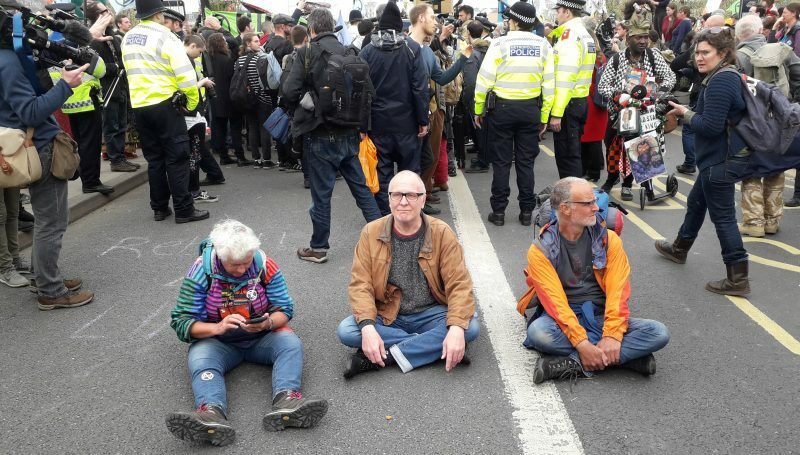 Two of our members joined other protestors on Westminster Bridge in London, which together with four other Central London bridges, was closed for a time when protestors lay down in the street and refused to move. 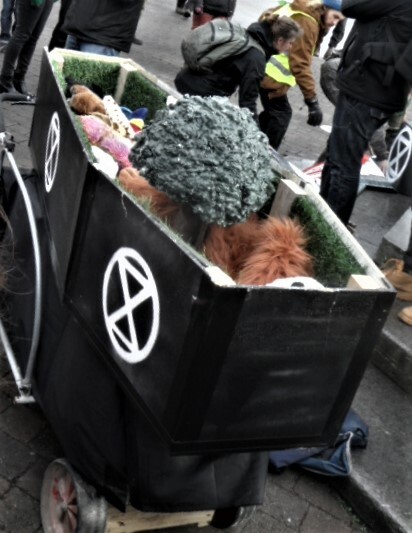 This was part of the Extinction Rebellion event which highlighted to Parliament nearby the extreme dangers of climate change and the slowness of our politicians’ response to this (seehttps://www.facebook.com/n/?video%2Fedit%2F&v=256401508378038&aref=1542581642400285&medium=email&mid=57af7fd3f0f4bG5af77be0e36bG57af846d5121dG3d&bcode=2.1542581644.AbxlXOpDr93dGsZQdBo&n_m=sigurdreimers%40hotmail.co.uk). Two other members joined another protest at the Department for Business, Energy and and Industrial Strategy where they were arrested for obstruction. This was followed by a demonstration by them outside the Brazilian Embassy against the new Brazilian president who has said he is prepared to sell the Brazilian rainforests for money. 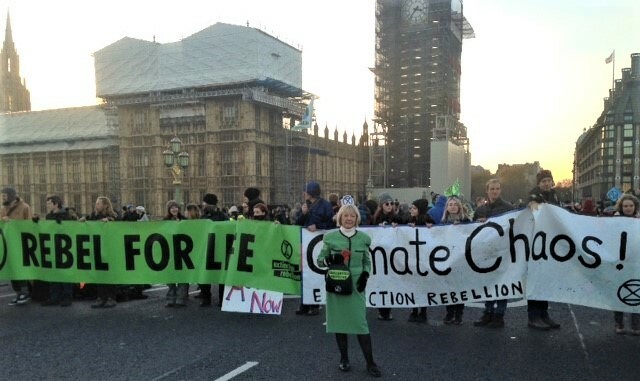 November 2018: This month is being marked by protests supported by leading academics and scientists, and organized under the umbrella of Extinction Rebellion (for further details see https://rebellion.earth/). Although we are a non-sectarian and non-party-political organisation, we will sometimes support actions by other groups where one or more of our members takes part and the action conforms to our aims. 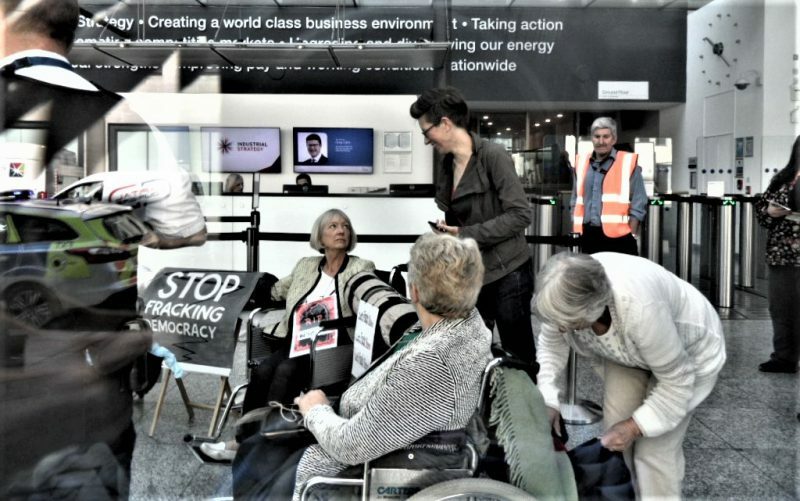 And so it was that one of our members, who is also a member of Christian Climate Action, was involved in a peaceful non-violent protest at the Department for Business, Energy and Industrial Strategy (where eight of us were involved in a lock-on last summer). 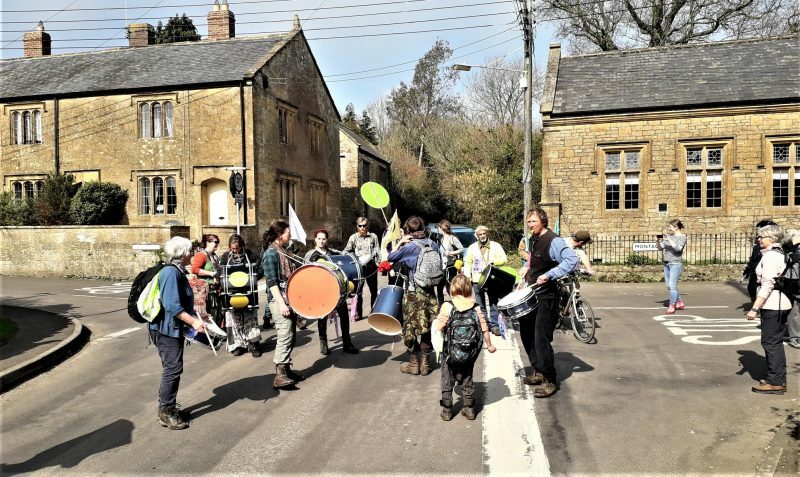 See newspaper reports in the Guardian: https://www.theguardian.com/environment/2018/nov/12/climate-activists-glue-hands-to-uk-government-building-in-new-protest?CMP=share_btn_fb&fbclid=IwAR3RZJIrLG3xkv4wX1o_6lmlaIxJj_7ZJJDiEEPDQc7r-078_MsV1P_QGKM and in Bristol Evening Post: https://www.bristolpost.co.uk/news/bristol-news/climate-change-parliament-square-arrest-2178488. Protests continue, and especially on Saturday 17th November in Parliament Square in London. 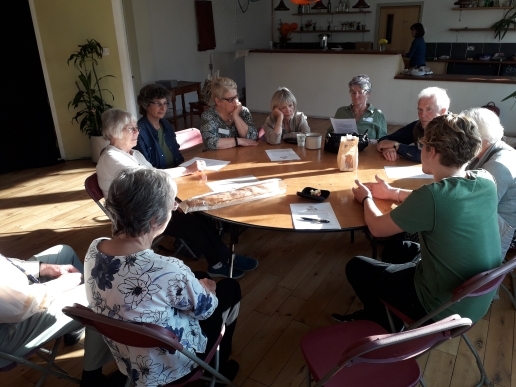 21st October 2018 Bristol: We held our first Gathering at Hamilton House to discuss with other interested seniors where we should go next with our campaigning. 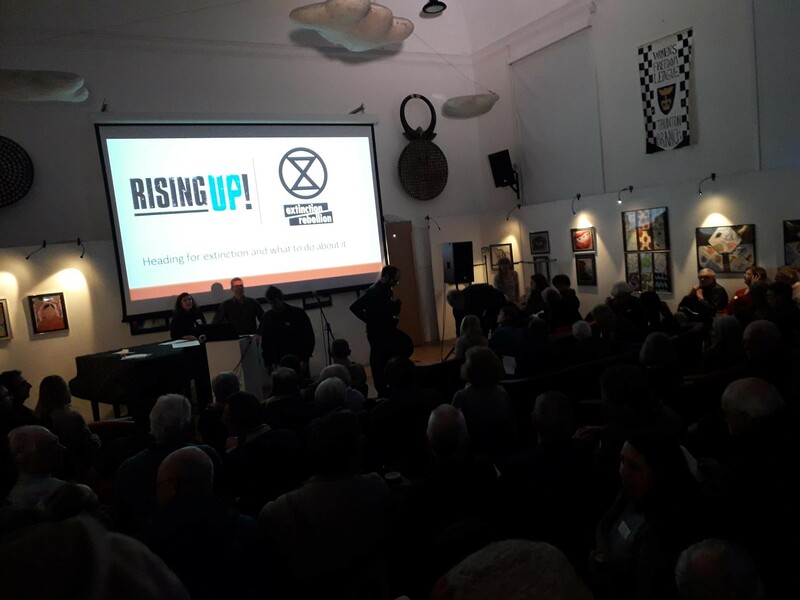 We had a review of the dozen or so actions in the past year, ranging from running climate change study groups to a full lock-on at the Department for Business, Energy and Industrial Strategy in London. We had lunch together and discussed possibilities for the future. As yet, no further actions have been planned, but follow the section on Forthcoming Events. 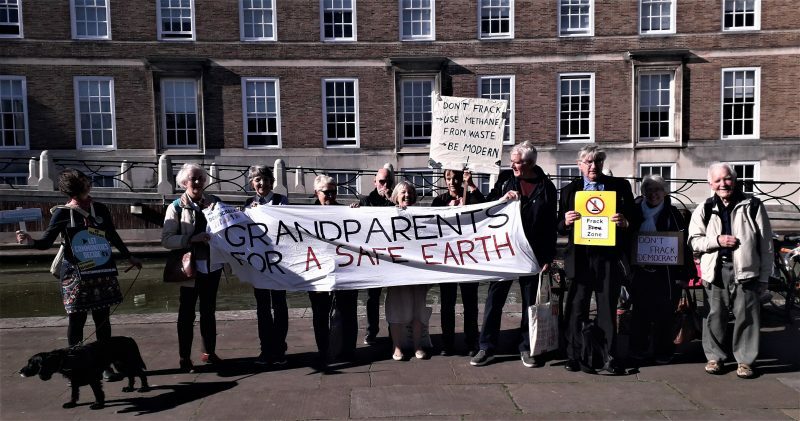 9th October 2018 Bristol: The Grandparents joined other local protest groups in a demonstration outside the Council House (City Hall) in Bristol against the Governments intention to override elected local Councils when they refuse to issue planning permission for fracking for shale gas in their area. This, then, was a protest both about fracking (and its effect on the climate) and local democracy. 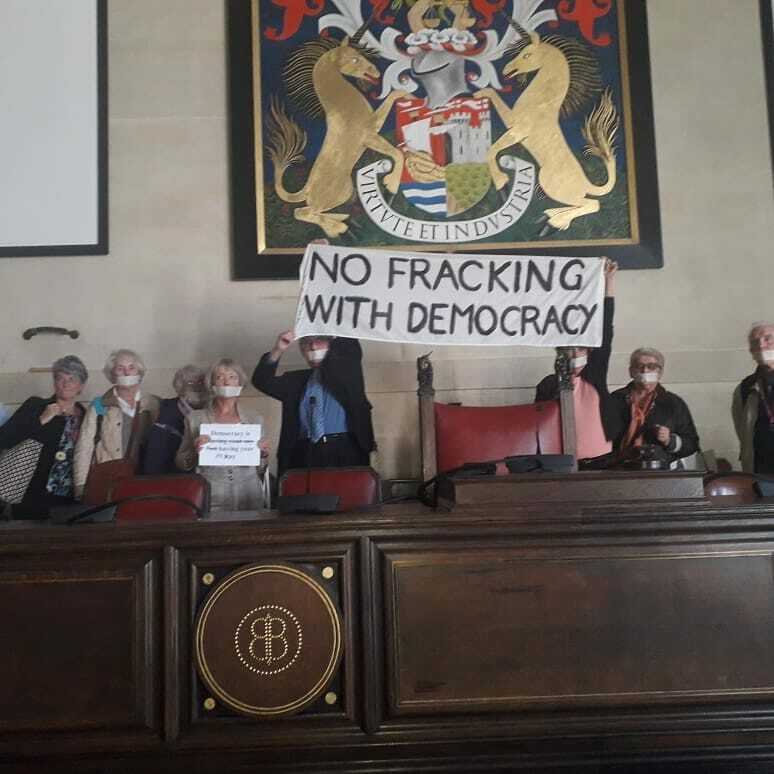 The Grandparents then moved into the main Council chamber for a brief silent demonstration, with mouths taped up as a sign of democracy being stifled. See video clips on YouTube as follows: https://youtu.be/GAZg1Atbp6U; https://youtu.be/l7IwYhP9kwk. 8th September 2018, Taunton and Bristol. We were involved in the Global Day of Action: 850 events were run in 95 countries, coordinated by Riseforclimate.org and 350.org. 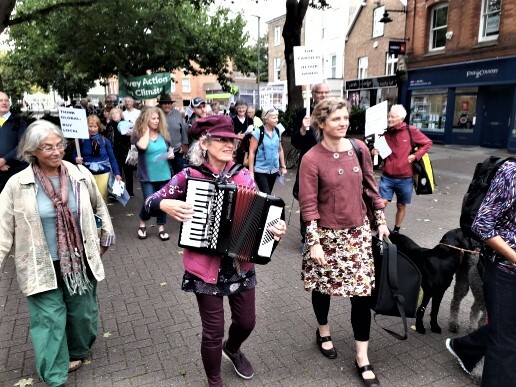 In Taunton 40 protestors marched and leafleted the public in the High Street, with a particular message to local politicians about their responsibility for addressing climate change. (see two photos below). At the end they sang their local version of a Bob Dylan classic: “The climate it is a-changin'” (see video clip https://youtu.be/acVjfGQCrJg). 13th June 2018, London. Ten of us were involved in a lock-on protest at Westminster in Central London, in order to draw attention to our extreme concerns at the likelihood that the Secretary of State, Greg Clark, will shortly be giving permission for the extraction of shale gas from Cuadrilla’s site near Blackpool. Five of our members spent nearly six hours with their arms locked together through reinforced tubes, in order to prevent the police from removing them from the Department’s Reception area. A letter of protest to Greg Clark was also delivered. As it turned out, the security officers made no attempt to remove the protesters, and the whole reception area was locked down throughout the day. The numerous visitors to the Department had to be directed to an entrance at the back of the building. The locked-on protesters were supported by two other members inside the reception area. These kept in touch by mobile phone with our three remaining members, who stood outside the building with banners and leaflets, and who engaged with passers-by, as well as deal with questions from various media organizaations, including a BBC TV interview. We received mostly supportive comments – including from a senior oceanographer who expressed grave concern about rising sea levels. The Police visited the building initially, but found that there was no further cause for them to be involved. In their view no crime was being committed. This action could not have taken place without the organizational and communications skills and experience of the campaigning group Reclaim the Power (www.reclaimthepower.org.uk) and the provision of technical backup and equipment. Numerous preparatory meetings had taken place in Bristol and in London. We were gratified by visits from another group of protestors who happened to be in London that day, and with whom we have had previous contact. Some of our members have already been to Cuadrilla’s Preston New Road site, near Blackpool, where there have been continuing protests over a long period of time against shale gas extraction (“fracking”), and the attendant dangers to the environment from fracking. Our protest underlines the need for all fossil fuels, including fracked gas, to remain in the ground, in order to diminish the dangers from increasing Carbon Dioxide emissions to our climate. Fracked shale gas is a particularly dangerous greenhouse gas, as it contributes significantly to global warming. We are particularly concerned that if permission is given for commercial extraction of fracked gas at Preston New Road, this could form a precedent for numerous other applications for similar schemes to be given the thumbs-up. We received well over twenty thousand hits on Facebook on the day, and a huge number of tweets and re-tweets. Articles were published the same day in newspapers ranging from Bristol Post to Blackpool Gazette. 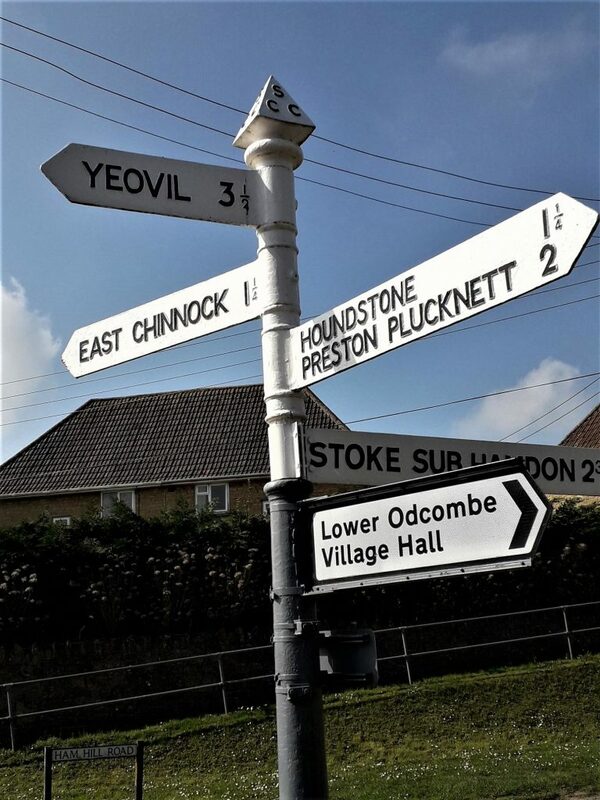 Although a BBC TV team interviewed us, the interview only appeared on BBC Somerset radio. A interview by SWLondoner can be seen on www.youtube.com by typing in Grandparents for a Safe Earth in the search box, where you can also find numerous other video clips from our earlier actions.